Affiliation: Ben-Gurion University of the Negev, Beer Sheva, Israel. This story is about Einstein’s theory of general relativity (GR)  and quantum mechanics (QM) . These two theories constitute the physics revolutions of the 20th century, and there are numerous attempts to unify them or, at the very least, understand how they work together. This story is also about time. Some would claim that we are still far from really understanding time . GR came to life in 1915, and was successful in explaining minute anomalies in the orbits of Mercury and other planets. In 1919, Sir Arthur Eddington was able, during a total solar eclipse, to verify a prediction of the theory when he headed an expedition which confirmed the deflection of light by the Sun. Some predictions, such as gravitational waves, remain unobserved. Another of the verified predictions of GR is that time is affected by gravity; it ticks at different rates depending on how close you are to a massive object. This has been confirmed for several decades now by sending rockets with clocks to large heights and recently, as atomic clocks became much more accurate, even by simply moving a clock a few centimeters higher in a lab. This effect was nicely displayed in the recent movie 'Interstellar'. GR was always considered strange and hard to fathom. It is rumored that in one of his lectures on GR, Sir Eddington was asked by Ludwik Silberstain: "Professor Eddington, you must be one of three persons in the world who understands general relativity." Eddington paused, unable to answer. Silberstein continued "Don't be modest, Eddington!" Finally, Eddington replied "On the contrary, I'm trying to think who the third person is." It is quite amazing to see how less than a century later GR is an important part of our day-to-day life, as it is an essential part in the GPS navigation system. QM is thought by many to be even weirder. It took away determinism, it allowed non-locality, and it even allowed objects to be in two places (or two states, e.g., of energy or of spin) at the same time. This seemed so ridiculous that one of the fathers of QM, Erwin Schrödinger came up with a thought experiment in which a cat is alive and dead at the same time, theoretically made possible due to QM. Other contributors to the birth of QM disliked it just as much. Einstein said that “God does not play with dice” and Louis de-Broglie believed determinism will come back in a more comprehensive theory. Niels Bohr said: “For those who are not shocked when they first come across quantum theory cannot possibly have understood it”. Yet, the theory is successfully withstanding endless testing for almost a century now. It is quite strange that these two successful theories have not been put together into one simple description of the universe. It remains to be seen what exactly the interplay between the two is: for example, some claim that the crucial process of decoherence, which is responsible for defining the border between the quantum realm and the classical world (as our day-to-day world of large objects is known), is powered by GR . Some even claim that the process of “wave-function collapse” is driven by GR . This process is responsible for the fact that out of many possible outcomes which exist according to QM, we see only one when we make a measurement. In the experiment we conducted, published recently in Science , we wanted to study the interplay between the two theories. Specifically we wanted to see what would happen if we take one clock and put it in two places in which time ticks at different rates, simultaneously. We then put the clock together again and observed it. In order to do this we used a device called an atom chip (see our website for many relevant papers). It is a powerful tool in manipulating the internal and external degrees of freedom of ultra-cold atoms. Every atom in a cloud of ultra-cold atoms (a Bose-Einstein condensate at -273 deg. Celsius) was put in two places simultaneously (known in scientific language as a spatial quantum superposition ), by utilizing a device called an interferometer. In parallel, every atom was turned into an atomic clock by manipulating its internal (spin) degrees of freedom. As we did not have sensitive enough clocks to observe the minute effect of GR, we induced an artificial time difference between the two locations occupied by the single clock (these two copies of the single clock are referred to in scientific language as wave-packets). Our proof-of-principle experiment indeed shows (as predicted by ) that time differences have a major effect on the quantum outcome expected from an interferometer (called an “interference pattern”). Specifically, we showed that time may act as a “which path” witness as if we measured in which of the two locations the clock is. Once such a measurement is made, QM tells us that the special state of quantum superposition is destroyed and the clock can no longer be in two places at the same time (this is called “complementarity”). However, we have also showed that if the hands of the clock in one wave-packet are rotated enough so that they again overlap the hands of the clock in the other wave-packet, we again cannot differentiate between the two locations and the superposition, and consequently the interference pattern is restored. Technically, we used very strong magnetic gradients to construct a Stern-Gerlach type of interferometer, and also used similar gradients to induce the relative time lag (using the Zeeman effect). The atoms are laser-cooled and then additionally cooled by forced evaporation. The atoms are isolated from the environment by the fact that the whole experiment is conducted in a vacuum chamber. The final outcome of the experiment is registered with a CCD camera observing the atoms. We now have a new tool at our disposal to investigate time and the interplay between GR and QM. What we will find is an open question. Usually, new tools bring new insight. The next step should be to use more accurate clocks and to separate the clock into positions farther apart so that we are able to see the effect of GR. The team included Ph.D. student Yair Margalit, post-doctoral fellows Dr. Zhifan Zhou and Dr. Shimon Machluf, and researchers Dr. Yonathan Japha and Dr. Daniel Rohrlich. In the picture are the first two authors of the paper: PhD student Yair Margalit (left) and post-doctoral fellow Zhifan Zhou (right). It is perhaps appropriate to end a popular article with some broad thoughts and even speculations. It stands to reason that human kind knows much less than what it doesn’t know. Namely, we are just beginning to explore and understand the structure and dynamics of our world. History and Philosophy of science teach us that our understanding is constantly changing and no theory is the “end of the road”. Will we see extensions to GR or QM in our lifetime? Will they somehow be unified? The atoms in our lab are our teachers; they are teaching us new things every day. As we build a better dictionary from atom language to human language we will be able to understand more. They are teaching us about our physical universe and about how to understand the strange mysteries of QM. They are teaching us technology (clocks, magnetic sensors, gravitational sensors, navigation, quantum communications and quantum computing). Eventually they may even teach us things that have to do directly with who we are. For example, is there such a thing as free will? On this latter topic I invite the reader to see a very short and simplified film I made . It makes me envious but also very happy to know that some of the young readers of this article will know much more than I ever will. I encourage the young reader to take up the adventure wholeheartedly. “General relativity turns 100”, Special issue, Science, 347 (March 2015). Table of contents. “Foundations of quantum mechanics”, Insight issue, Nature Physics, 10 (April 2014). Table of contents. Lee Smolin, "Time Reborn" (Mariner Books, 2014). Igor Pikovski, Magdalena Zych, Fabio Costa, Časlav Brukner, “Universal decoherence due to gravitational time dilation”, Nature Physics, 11, 668-672 (2015). Abstract. Roger Penrose, "The Emperor's New Mind: Concerning Computers, Minds, and the Laws of Physics", Chapter 6 (New York: Oxford U. Press, 1989) ; Lajos Diósi, “Gravity-related wave function collapse: mass density resolution”, Journal of Physics: Conference Series, 442, 012001 (2013). Full Article ; Angelo Bassi, Kinjalk Lochan, Seema Satin, Tejinder P. Singh, Hendrik Ulbricht, “Models of wave-function collapse, underlying theories, and experimental tests”, Review of Modern Physics, 85, 471 (2013). Abstract. 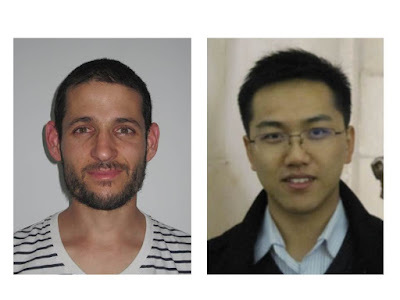 Yair Margalit, Zhifan Zhou, Shimon Machluf, Daniel Rohrlich, Yonathan Japha, Ron Folman, “A self-interfering clock as a 'which path' witness”, published online in 'Science Express' (August 6, 2015). Abstract. This new terminology is meaningful as all attempts to interpret the reality of this situation with day-to-day language have led to some sort of contradiction. The strange reality of the quantum world can perhaps only be accurately described by mathematics. Using words, which originate in our day-to-day (“classical”) experience, always fails those who attempt to harness them for the description of the quantum world. Perhaps one may alternatively state that the clock is in a state where it somehow “feels” how time “ticks” in several places at once. Magdalena Zych, Fabio Costa, Igor Pikovski, Časlav Brukner, “Quantum interferometric visibility as a witness of general relativistic proper time”, Nature Communications, 2, 505 (2011). Abstract. 2Physics Article. “ ‘Are we alive?’ – a thought by Ron Folman”: YouTube Link.